Our Abpromise guarantee covers the use of ab17043 in the following tested applications. Shipped at 4°C. Store at +4°C short term (1-2 weeks). Upon delivery aliquot. Store at -80°C. Avoid freeze / thaw cycle. Belongs to the histone H4 family. Acetylation at Lys-6 (H4K5ac), Lys-9 (H4K8ac), Lys-13 (H4K12ac) and Lys-17 (H4K16ac) occurs in coding regions of the genome but not in heterochromatin. Citrullination at Arg-4 (H4R3ci) by PADI4 impairs methylation. Monomethylation and asymmetric dimethylation at Arg-4 (H4R3me1 and H4R3me2a, respectively) by PRMT1 favors acetylation at Lys-9 (H4K8ac) and Lys-13 (H4K12ac). Demethylation is performed by JMJD6. Symmetric dimethylation on Arg-4 (H4R3me2s) by the PRDM1/PRMT5 complex may play a crucial role in the germ-cell lineage. Monomethylated, dimethylated or trimethylated at Lys-21 (H4K20me1, H4K20me2, H4K20me3). Monomethylation is performed by SET8. Trimethylation is performed by SUV420H1 and SUV420H2 and induces gene silencing. Ubiquitinated by the CUL4-DDB-RBX1 complex in response to ultraviolet irradiation. This may weaken the interaction between histones and DNA and facilitate DNA accessibility to repair proteins. Monoubiquitinated at Lys-92 of histone H4 (H4K91ub1) in response to DNA damage. The exact role of H4K91ub1 in DNA damage response is still unclear but it may function as a licensing signal for additional histone H4 post-translational modifications such as H4 Lys-21 methylation (H4K20me). Sumoylated, which is associated with transcriptional repression. ab17043 (at 0.01 and 0.1 μg) used in Dot Blot to test for cross-reactivity of ab9051 (1/2500). 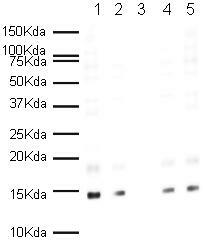 An HRP-conjugated Mouse anti-rabbit polyclonal (1/10000) was used as the secondary antibody. Publishing research using ab17043? Please let us know so that we can cite the reference in this datasheet. 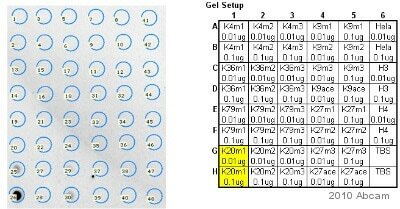 I have a few quick questions regarding a set of peptides we obtained and plan to use in pull-down experiments. The catalog numbers are ab14963, ab17043, ab14964, ab17567, corresponding to unmodified H4, H4K20me1, H4K20me2, and H4K20me3. - Do all these peptides have the same sequence? Is it possible to obtain that sequence? - what is the length of these petides? - do these peptides carry any sort of modification, i.e. do they have a cysteine at the N or C terminus, a biotin or a free accessible (not amidated or otherwise blocked) carboxy at the C terminus? Thank you for contacting Abcam regarding our Histone H4 peptides. The specific sequences of these peptides are considered proprietary and are not available on our website. The peptides are short, 8aa peptides and do contain a C terminal cysteine. If you would like additional information, please email our call our Scientific Support Department. I hope this information is helpful. Please do not hesitate to contact us if you have any additional questions.